Hannspree has announced its new netbook, the SN10, available exclusively at The Carphone Warehouse. The Hannspree SN10 will cost £229, and follows on from the AV specialist's first foray into netbooks last year. The netbook will be available in either glossy red or glossy black and includes a free 'ultra chic' black carry bag which Hannspree insists is "already a favourite with the organisers of London Fashion Week". Spec wise, the SN10 has a 1.66GHz Intel Atom processor, 10 inch-1024x768 resolution and a full size keyboard. 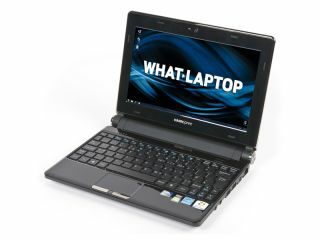 It also has 802.11b/g/n Wi-Fi, 160GB of storage, 1.3MP webcam, 3 USB ports and a 3-in-1 card reader. The Hannspree SN10 is available at Carphone Warehouse now.